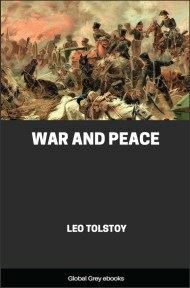 Childhood was the first published novel by Leo Tolstoy, released under the initials L. N. in the November 1852 issue of the popular Russian literary journal The Contemporary. 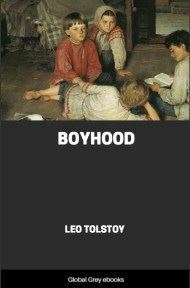 It is the first in a series of three novels and is followed by Boyhood and Youth. 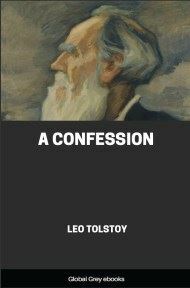 Published when Tolstoy was just twenty-three years old, the book was an immediate success, earning notice from other Russian novelists including Ivan Turgenev, who heralded the young Tolstoy as a major up-and-coming figure in Russian literature. 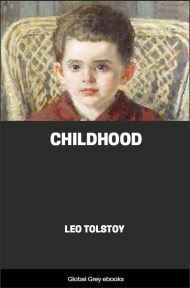 Childhood is an exploration of the inner life of a young boy, Nikolenka, and one of the books in Russian writing to explore an expressionistic style, mixing fact, fiction and emotions to render the moods and reactions of the narrator. Karl Ivanitch was taken aback. He left off tickling my feet, and asked me kindly what the matter was. Had I had a disagreeable dream? His good German face and the sympathy with which he sought to know the cause of my tears made them flow the faster. I felt conscience-stricken, and could not understand how, only a minute ago, I had been hating Karl, and thinking his dressing-gown and cap and tassel disgusting. On the contrary, they looked eminently lovable now. Even the tassel seemed another token of his goodness. I replied that I was crying because I had had a bad dream, and had seen Mamma dead and being buried. Of course it was a mere invention, since I did not remember having dreamt anything at all that night, but the truth was that Karl's sympathy as he tried to comfort and reassure me had gradually made me believe that I HAD dreamt such a horrible dream, and so weep the more—though from a different cause to the one he imagined. When Karl Ivanitch had left me, I sat up in bed and proceeded to draw my stockings over my little feet. The tears had quite dried now, yet the mournful thought of the invented dream was still haunting me a little. Presently Uncle [This term is often applied by children to old servants in Russia] Nicola came in—a neat little man who was always grave, methodical, and respectful, as well as a great friend of Karl's. 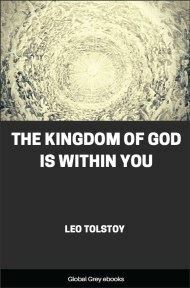 He brought with him our clothes and boots—at least, boots for Woloda, and for myself the old detestable, be-ribanded shoes. 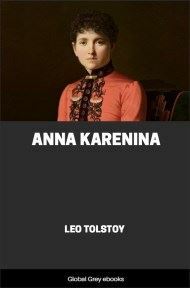 In his presence I felt ashamed to cry, and, moreover, the morning sun was shining so gaily through the window, and Woloda, standing at the washstand as he mimicked Maria Ivanovna (my sister's governess), was laughing so loud and so long, that even the serious Nicola—a towel over his shoulder, the soap in one hand, and the basin in the other—could not help smiling as he said, "Will you please let me wash you, Vladimir Petrovitch?" I had cheered up completely. "Are you nearly ready?" came Karl's voice from the schoolroom. The tone of that voice sounded stern now, and had nothing in it of the kindness which had just touched me so much. In fact, in the schoolroom Karl was altogether a different man from what he was at other times. There he was the tutor. I washed and dressed myself hurriedly, and, a brush still in my hand as I smoothed my wet hair, answered to his call. Karl, with spectacles on nose and a book in his hand, was sitting, as usual, between the door and one of the windows. To the left of the door were two shelves—one of them the children's (that is to say, ours), and the other one Karl's own. 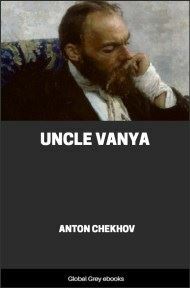 Upon ours were heaped all sorts of books—lesson books and play books—some standing up and some lying down. The only two standing decorously against the wall were two large volumes of a Histoire des Voyages, in red binding. On that shelf could be seen books thick and thin and books large and small, as well as covers without books and books without covers, since everything got crammed up together anyhow when play time arrived and we were told to put the "library" (as Karl called these shelves) in order. The collection of books on his own shelf was, if not so numerous as ours, at least more varied. Three of them in particular I remember, namely, a German pamphlet (minus a cover) on Manuring Cabbages in Kitchen-Gardens, a History of the Seven Years' War (bound in parchment and burnt at one corner), and a Course of Hydrostatics. Though Karl passed so much of his time in reading that he had injured his sight by doing so, he never read anything beyond these books and The Northern Bee.